Editor: Josie Shields-Stromsness, a young American woman from the Bay Area, currently lives near Bethlehem and has sent friends a personalized account about the devastating assault against the Gaza Strip by Israeli military forces. Josie is the daughter of Cathy and Carl, who are good friends of a number of current and former Ocean Beach residents. Josie has been involved with the Palestinian people for many years and last year married a young man in Palestine. They now work with the Ibdaa Cultural Center in Bethlehem. Josie sent her letter to good friend Dickie Magidoff – who worked on the original OB Rag back in the 1970s – who forwarded it to us. Josie, then is our California daughter, writing from the Holy Land, and helping us understand what is actually happening. It’s 2009 but I have a hard time calling it a new year. I didn’t go to a new year’s eve party – they were all canceled out of respect for the people in Gaza. Instead Hazem and I went to dinner with a few friends and came home to once again watch the news. The broadcasted firework displays, which have always amazed and dazzled me, only reminded me of the sky in Gaza. The lights flashing in their sky killed 6 more people last night. Since Saturday, 400 people have died and more than 2000 are injured. But these numbers barely scratch the surface of the death and destruction. Islamic University in Gaza City has been turned into rubble. 20,000 students watched their futures crumble. Hospitals do not have the supplies they need to treat the injured after 18 months of an Israeli blockade. Many of the critically injured could have lived but now they are dying too. A mother in Gaza explained to a journalist that her children kept saying that they wanted to die with her. They no longer dared to hope their family would survive so they asked simply that they not be left alive without a mother. The people in Gaza who live through this horror will not be able to go on with their lives. How could a child return to classes at the same school where she watched her classmates die? How could the remaining members of a family rebuild their home in the same place that their mother/brother/child was killed? 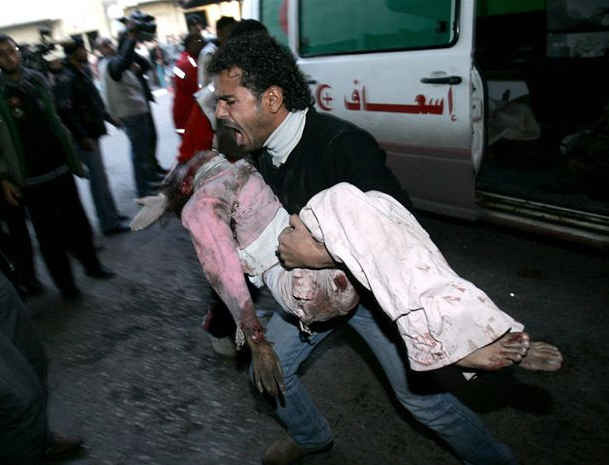 I know people around the world have come back to life after massacres but it’s hard to imagine how people in Gaza will. Especially with the knowledge that Israel could do this again at any time. It’s devastating and nothing we can do now will change any of this. It is just too late. But still I find myself trying to do something useful. It’s too painful to passively take in this information. I’ve been working closely with Dr. Mona, a dear friend and colleague from Gaza, to send medicine. We started working on a shipment last month but even then the task of getting medical aid into Gaza was daunting. Truckload upon truckload of food, medicine, and other basic supplies were turned away at the border each day. Through Dr. Mona’s connections MECA will be able to send in both the vital medications for children and infants that we’ve been working on as well as emergency supplies that were requested by organizations in Gaza. Surely this shipment will help some of the victims of the air strikes recover and will help curb the high levels of malnutrition among children. It may even save the lives of children with asthma or serious infections. But what about next week, next year, or the next generation? There are demonstrations around the world, calls for boycotting and sanctioning Israel, letter-writing campaigns, etc. These are all important and will, I hope, contribute to change. I’ve been uplifted by the emails and photos friends have sent about the responses to these attacks in their communities. But the mainstream media is telling such a different story then the one I have seen and heard. I have been updating the MECA website with news about Gaza for the last six days. This has been almost more difficult for me than watching images of five dead sisters pulled out from under their collapsed home or of dozens of bodies splayed on the pavement and the few survivors screaming and kissing their dead friends. I go from one article to another, one news source to another. I search for an article that doesn’t try to justify Israel’s actions, doesn’t try to equate homemade rockets with American-made F16s and apaches. It’s hard to find in English. So I want to say a few things about the ceasefire, targets, and self-defense in my own words. During the six-month ceasefire between Israel and political factions in Gaza, it was Israel that consistently broke its commitments. Israel killed 22 people in Gaza and injured another 62 during the ceasefire. And at the beginning of this school year, notebooks and school supplies weren’t allowed into Gaza (very reminiscent of the sanctions on Iraq). Would you renew a ceasefire that brought continued attacks and continued shortages of food, medicine, and electricity? What would be the point of choosing to die slowly? The statements from Israeli spokespeople have made me physically ill. Their line about hitting targets reminds me of an argument I had at Brown University right after the US started bombing Afghanistan. The anti-war group I was a part of at the time was highlighting the devastating costs of our bombing campaigns on the people in Afghanistan. An angry student told me that our bombs are so smart we could hit a nickle-sized target on the ground. That may be true but when a bomb hits the nickle, how much of the surrounding area does it blow up too? I’ve been to Gaza several times over the last five years. I’ve even been to Gaza when F16s are flying overhead, targeting people in illegal extra-judicial assassinations or buildings. It’s a very crowded place and when Israel attacked the Ministry of Interior in 2006, the impact woke me up in an apartment several blocks away and the family next door lost their home. but thankfully not their lives. Just now, Israel carefully targeted a Hamas leader in another illegal assassination. Nine of his family members were killed along with him. The other question that comes to mind for me is just how smart are the people controlling the smart bombs? Three days ago a military drone blew up a truck and eight men while they were loading oxygen canisters used for welding. Israel maintains they were grad rockets but the photos and reports tell a different story. The second line Israel keeps feeding an unquestioning media is that it is defending its citizens. The idea that the rockets are a match for the fourth most powerful military in the world is laughable. As is the idea that you can kill people into submission. I don’t know if the people in power never learn or if they have ulterior motives. Honestly, I don’t care to understand their thinking – it is too inhumane. Yesterday , my father went to bakery from 5 AM he waited 5 hours even get one A bundle of bread. This bread not can’t enough for my family because consist of 11 members .But today I go to all bakeries. I can’t find any loaf of bread due to be closed. We and my family cannot communicate with our relatives and friends because of the lack of the connecting network also every hour we have a martyr or even more because of the raining missiles on our homes , mosques and even hospitals ,There is no safe place we can go to. In the day our life concentrated in burial of the martyrs who were thousands in hospitals after a short farewell or even without a final look because of the time shortage those martyrs are graved in groups imagine that a group of martyrs graved in one grave. At night our camp like ghosts city no sound but the sound of the various military aircrafts in every attack our heats and the children hearts is shaking. There is a horror in every minute and it is clear especially on the children, for example, there was four sisters in one family killed from the Israeli occupation ,when stay in their home, and there is children in the south of Rafah. Also, A woman was going to the bakery to buy bread for her family when she was walking in the street killed the Israeli occupation. I have two message to the world. My message to the lovers of peace and freedom in the world. Imagine your life is no electricity ,destroyed homes , voice missiles of the day and night , and no food. Imagine your children and your family tell you we are afraid of the missiles can not sleep from the Voice of the aircraft. Imagine you and keep the commentary. Make to end the siege and stop the killings and demolition of houses for our children and to provide assistance to the people through rallies, sit-ins. Finally, I invite you to come to Gaza and see the Holocaust. Wishing (and working) for a better future. Please check the MECA website for news, analysis, and actions as well as a way to donate for the medical shipment. I will be leaving next week to meet our Gaza Director Dr. Mona El-Farra in Egypt to receive five tons of medicine for infants and children that we purchased and had shipped from Holland. We will also purchase emergency supplies from a Palestinian pharmaceutical company in Cairo to help treat the thousands who have been wounded in the horrific Israeli attacks. As soon as I return, I will begin working on another shipment of medical aid to Gaza. While we watch in horror as Israel’s bombs kill and maim children in their homes and their schools, we can do something that will truly make a difference. Dr. El-Farra, all the people she works with in Gaza, and the thousands of families they serve, join me in asking for your support at this terrible time to help save the lives and health of thousands of children. or check their website: http://www.mecaforpeace.org, for info for online donations.